Normally Visa formalities and it’s process may give you a headache at least once in your journey. So, Now we are coming with a good news to each and every Indian Passport holder. Visa based travelling rules and regulations are not similar to each and every country. These Visa rules and regulations can changed according to their governance of different countries. As per Passport Index’s norms, An Indian passport holder can travel 59 countries without visa. This is based on the Passport power of their countries. The United States of America (USA) and United Kingdom (UK) jointly hold the top position in the list of Visa Free Countries. The citizens of USA and UK can travel 147 countries without visa / visa on arrival. Top 10 Low Fuel Consumption Tips to Increase Bikes Mileage. These 40 Human Psychological Facts Makes Your Mouth Open. While Indian Passport holders are planning to visit these 59 countries they don’t bother about visa formalities. Except India itself you can travel 58 countries without visa / visa on arrival. Indian Passport holders can travel these countries without visa / visa on arrival. 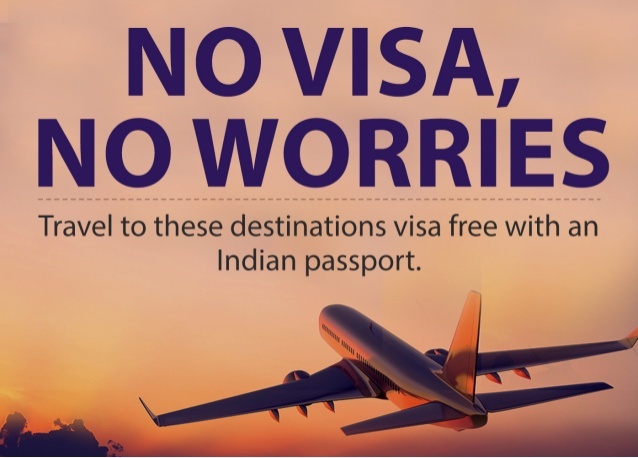 Here is the list of Visa Free Countries for Indian Passport Holders. Ok.. Guys.. If you like this “List of Visa Free Countries for Indian Passport Holders” article. Share it to your friends.